The Zany Knits | An online shop selling original PDF knitting patterns. That’s right, I finally got my arse in gear and set up on my online shop for Ravelry. Click on the logo below to have a little browse. Aside from being a great place to discover new designers and to chat about all things knit/crochet related it’s an excellent online store. The best bit is that you can buy patterns without needing to sign up – all you need is a Paypal account. There’s also tonnes of freebies published every week! I thought it might be time to write a few notes about my Cuddly Caterpillar knitting pattern. It’s a pretty quick knit for someone needing a last minute gift and makes a good first project for knitting in the round. The body itself is really fun to make as it’s all one piece from the end of his body to the tip of the nose – the feet and eyes are worked separately and sewn on. It’s a great project for using left over yarn and works up to about 4 inches by 18 – but you can make up larger or smaller, depending on the yarn you use. Click on the picture for a link to my Etsy listing. Enjoy! Hi ladies. I’m a fun loving genuine frog prince, looking for an open minded princess for fun times or maybe more. Must be at least an 8/10, toads need not apply. I’m not looking for anything serious right now but the ability to reverse spells with a single kiss would be a plus. Must enjoy long hops in the country. Hobbies: Must enjoy long hops in the country, slow hops in the bedroom and good hops at the bar. Perfect Match: Brains a plus, but by no means a must. Of Royal extraction with own income preferred. Drives: Algae 2800 X-Class – 6 x 6 with 540bhp, 5.5-litre bi-turbo V8, 0-62mph in 6.4 seconds. Yeah baby, gets me through the swamps in styl e.
I simply loved making this adorable Penguin Hot Water Bottle Cover. It was really important to capture his fun and quirky character and tried a number of different styles to get him just right. I wanted him to be nice and cuddly, so getting a nice fluid line from the top of the head to the tip of his wings was essential in creating the short and squat penguin look. He’s designed to fit a standard 2litre hot water bottle, is knitted on 2 needles and uses a velcro fastening at the back. I love making these novelty hot water bottle covers and they make great presents, as well as a good larger project. 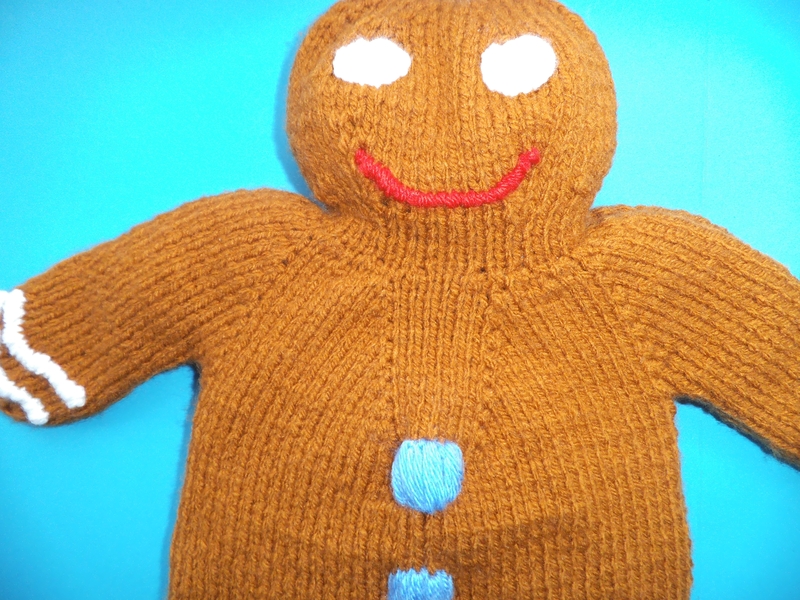 The Gingerbread Man’s a really fun story and instantly conjure childhood memories of being in the kitchen with mum. Great combo for adults and children alike. 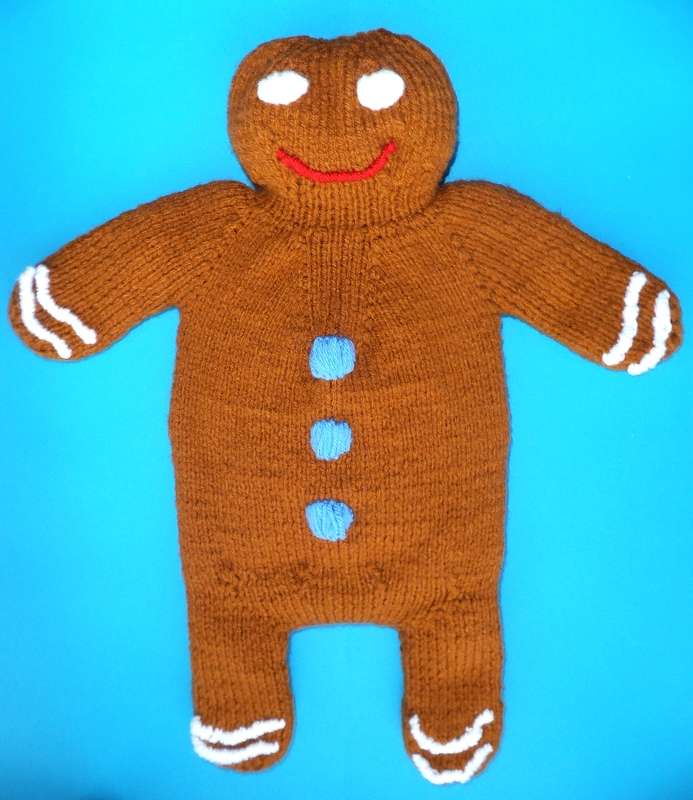 The biggest challenge in the design was keeping the flatness of the gingerbread man, although he was hiding a full sized hot water bottle. The first decision was to make the body in one piece on the front, with two panels on the back to hide a velcro fastening. He has a little extra give in the tummy area so the water bottle can sit comfortably when full. I’m very pleased with the stitching detail on the neck and top of the limbs, as they look really tidy and fluid. Have a look at this cute little Devilish Teddy! He started off life as a good luck pocket size teddy bear, but he just got cheekier as I made him until he became the devilish little chap he is today. 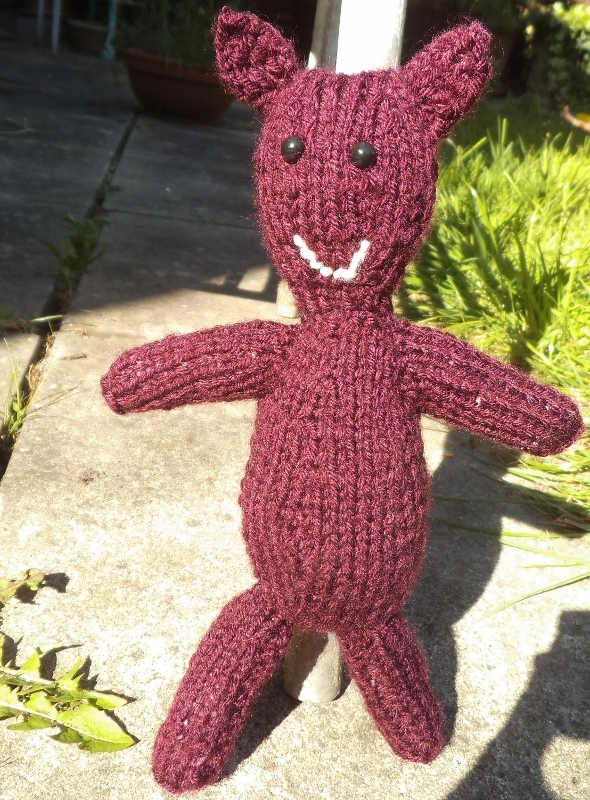 He’s knitted on two needles (4.5mm) and is really simple to make. All you need is a small amount of stuffing, about 40g worsted yarn and some safety eyes. It’s a pretty quick knit, but the making up is quite time consuming, as is always the case when working on two needles! You can buy the pattern at http://ow.ly/l1aLm and please do send on pictures of the versions you’ve made as it’s always fun to see! Welcome to my new blog showcasing what my fab new company The Zany Knits is up to! I design and sell knitting patterns online for unique, fun projects. I’ve always loved creating beautiful handmade gifts for friends and have finally taken the leap in making it into a business.